Spring is a time for gardening, cleaning, and Easter celebrations. But these springtime activities can also pose some hazards to furry family members. Chemicals, poisons, and other non-pet-friendly substances are often used in spring cleaning and lawn maintenance tasks, while the season itself ushers in potential hazards such as poisonous plants, active wildlife, and increased outdoor activity. To keep your pet safe, it’s important to take note of hidden pet dangers that may be lurking in your home, garage, or yard. Taking a few precautions prior to tackling seasonal chores can help ensure the safety of your four-legged springtime sidekick. Here are a few tips on keeping your pets safe in the springtime, according to the American Society for the Prevention of Cruelty to Animals (ASPCA). Garden with care. The quest for a lush lawn prompts many homeowners to use fertilizers, insecticides, and herbicides. However, the ingredients in these products can be dangerous to pets who ingest them. 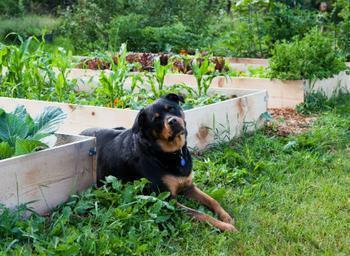 Be sure to keep fertilizers and pesticides away from pets. Take note of toxic plants. Many popular springtime plants, such as rhododendrons and daffodils, are toxic to pets and can even be fatal if eaten. Check out the ASPCA's full list of toxic plants to find out which plants should be kept away from pets. Use household cleaners safely. Read the instructions on all products that will be sprayed or used near your animals. All cleaning products -- even those labeled “all natural” -- can be harmful to pets. To learn more, visit the ASPCA’s list of poisonous household products. Home improvement safety. The paint, solvents, nails, and power tools you use while taking care of a home project on your to-do list may be hazardous to your pet. Some products may cause injury while others may cause chemical burns or irritation. Read all labels to see if the product is safe to use around your dog or cat. Better yet, confine your pet to a pet-friendly room during home improvement projects. Watch pets around Easter treats. Chocolate bunnies and other sweet treats, as well as certain Easter decorations, can be toxic to dogs and cats. Lilies can be fatal to cats that ingest them, and plastic grass can result in severe vomiting and dehydration or an obstructed digestive tract.